The frame was just what we needed. The frame that I purchased was the whipped cream and cherry on top of a gift for a friend. It became the frame for an oil painting of 2 miniature Yorkies. The frame was perfect coloring for the small Yorkies. The recipient of the gift was so absolutely thrilled to receive the portrait of her babies in the lovely frame. I have purchased several frames over the years from picture frames.com in various sizes and have always been very pleased with the frames and the prompt deluvery. I appreciate your good service also. But do hate to pay shipping which boosts the price of the frame. 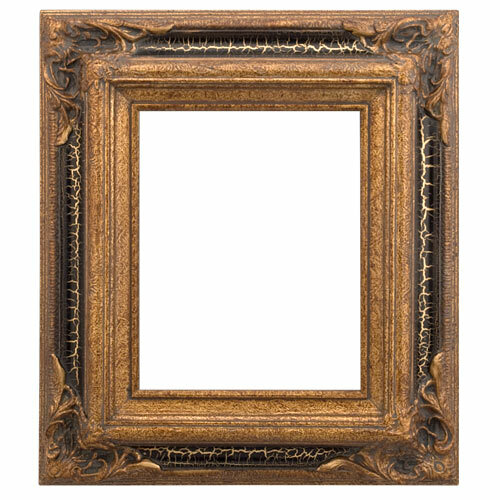 This frame works great for work that you want to look old or museum looking. This frame is nice, but not quite as solid/heavy as I thought it would be. The wood used to craft it is somewhat cheap. As far as look, it is a pretty frame so overall I'm happy with it. Hello Allison! Thank you so much for taking the time to submit your review. This beautiful Estate Frame is indeed a 100% wood frame. The exquisite finish with the ornate corners is an laminate overlay placed over poplar wood. This results in a durable, attractive yet light weight frame. 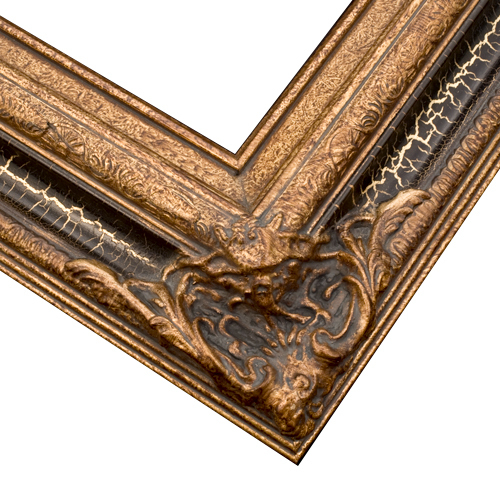 We encourage you to please order frame samples of our frames before making your purchase. That way you are sure that the frame is suitable for you. I can be reached at 1-800-332-8884. Thank you again for your business! Looks like a quality antique! Absolutely gorgeous! Looks like an antique! Perfect for displaying my 8x10 canvas print of Leonardo da Vinci's Salvator Mundi. Can send pictures when I have it mounted! Price was great and immediate shipment at a time I had a tight deadline. Perfect Frame for my Painting. I had an 8x10 oil painting that needed a frame. It's a standard size, but it's not easy to find a frame that will fit a canvas that size (most frames are larger, and the smaller frames are more for flat art/photos). I COULD get something Custom made, but pre-made are less pricey, and it bothered me to have to go custom for a standard size painting! I looked in stores and the internet and really couldn't find much. So finding pictureframes.com was perfect for me. The frame was shipped quickly. Getting the hardware to clip in the canvas, and to put on the wire to hang it was easy, and came with instructions. 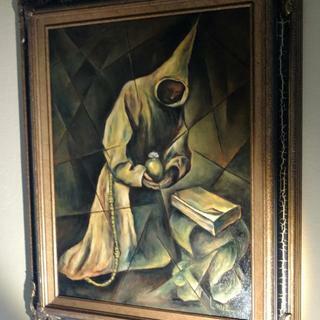 The frame was exactly as pictured... And my painting looks as I hoped in the frame. Altogether, I am very happy with this purchase! The frame came out great, true to size and the color was perfect. Packaging was good as well, nicely protected. Only issue I had was that I was not notified that the original order had shipped and it ended up being delivered to an incorrect address (UPS error) Customer service contacted me to fix the issue and send another ASAP. I had the frame in time for Christmas. Needed a frame for an old 40's picture. Prior purchases were very satisfactory, have faith this item will be just what my latest painting needs. Seem to be of same decor & style as my other picture frames. Will know once I get frame if I made right choice. I believe it's a complimentary match to another frame. I love the fact that I can get any size I want, I think you're very reasonable in price. I have ordered several frames and have never been disappointed. I think this frame is very pretty, and I needed a wider frame for an 11x14” oil painting of flowers. has the look of aged classic. I ordered the sample and it was well made and looked much more expensive than it was. I chose this frame because I already purchased this same frame 3 years ago for a picture of my husband and I that hangs on our living room wall. It looks beautiful!! My daughter absolutely loved it, so for a gift to her, I had a family beach picture made up for her and ordered this frame to put it in, and will give it to her as a Christmas gift this year. Can't wait...she's going to love it!!! It's beautiful! The slight crackling makes it look like an antique frame! i need this frame in the size 24x30? This frame only comes in the standard sizes available on the product page. Sorry for the inconvenience. If you have any additional questions do not hesitate to contact our friendly framing experts at 1-800-332-8884. Can this frame be custom sized? BEST ANSWER: This frame is a Ready Made and does not come in custom sizes. Please take a look at some of our customizable collections that have Ornate styles. I have attached an example below. This is a frame from our Marquis Collection.